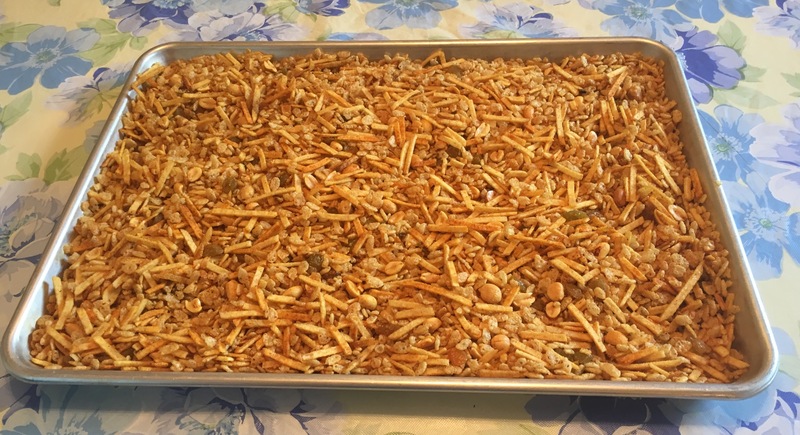 We have been buying Indian snack mix (also called “hot mix”) for years, but I recently learned how to make a homemade version from my friend and cooking teacher Farida. This is my variation on her recipe. I love adding whole coriander seeds because they provide a subtle citrus note to the mix. In a large bowl combine Rice Krispies, shoestring potatoes, peanuts, and raisins. Toss, then set aside. In a small bowl combine sugar, salt, turmeric, cayenne, paprika, ground coriander, garlic and onion powder, and a pinch of citric acid. Mix and set aside. In an 8-quart heavy bottom pot, heat oil on medium high heat. Once it is warm add whole coriander seeds and mustard seeds. Stir for about 2 minutes and when the mustard seeds begin to pop and coriander becomes fragrant add the cereal mixture. Stir to mix the mustard and coriander seeds into the cereal. Cook for 2 minutes or so until the cereal mixture begins to get a bit of golden color. Remove from heat and sprinkle in spice mixture. Stir well to combine. Pour onto a baking sheet. Spread and let cool completely. Store in an airtight container. Makes 10-12 cups. This entry was posted in Appetizers, Miscellaneous. Bookmark the permalink.